FEATURES WALL MOUNTED/COUNTER-TOP DESIGN- BEST SUITED FOR DOMESTIC PURPOSE Kent ACE+ is a compact water purifier with a wall mountable design, best fit for Indian kitchens. It saves expensive counter space and provides convenience while drawing water. It has an elegant transparent cover which makes all the components in the purifier easily visible and displays the cutting-edge technology behind it. Also the storage tank has a unique water level indicator that shows the level of water in it. 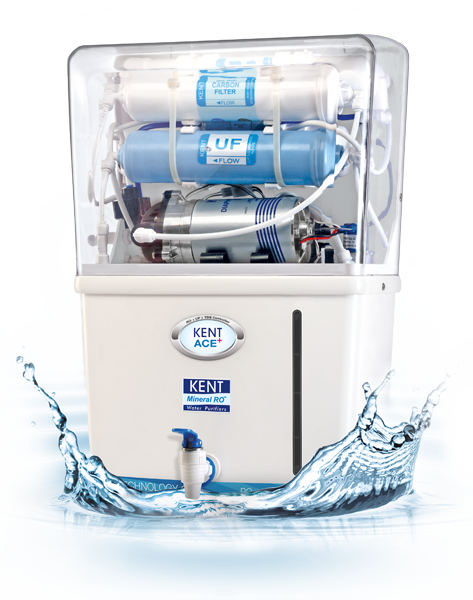 DOUBLE PURIFICATION BY RO + UF WITH TDS CONTROLLER KENT’s patented KENT's Mineral ROTM technology provides double purification of RO + UF, which removes even dissolved impurities such as chemicals and salts. The TDS controller maintains essential natural minerals, thereby providing 100% safe & tasty drinking water, which is ideal for consumption. PURIFIED WATER STORAGE CAPACITY OF 7 LITRES WITH WATER LEVEL INDICATOR Kent ACE+ has 7 litres of purified water storage capacity with a unique water level indicator. The storage tank ensures continuous supply of purified water even in the absence of electricity or running tap water. EQUALLY SUITABLE FOR WATER FROM ALL SOURCES SUCH AS BORE-WELLS, TANKS OR TAP-WATER Kent ACE+ purifies water from different sources such as bore-wells, overhead storage tanks, water tankers and even municipal taps. 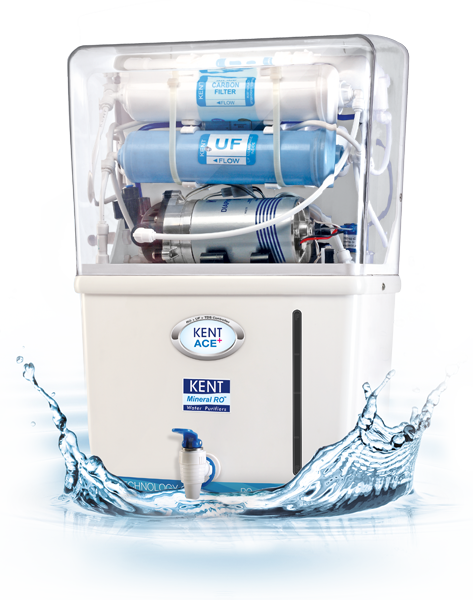 Patented KENT's Mineral ROTM technology allows the user to adjust the TDS level of purified water and thus breaks the myth that RO purifier can only be used for raw water having TDS level greater than 500 ppm. FULLY AUTOMATIC OPERATION WITH AUTO-ON AND AUTO-OFF FUNCTION Fully automatic operation allows the purifier to begin purification whenever water level in the purified water storage tank falls below maximum and stop when the tank is filled or when there is no inlet water supply. This ensures trouble free operation without the need of manual intervention. BUILT-IN SMPS THAT SUPPORTS WIDE RANGE OF INPUT VOLTAGE (100-300V AC) FOR HANDLING VOLTAGE FLUCTUATION Kent ACE+ incorporates a built-in rugged SMPS (Switching Mode power supply) instead of a standard power adaptor. It is equipped to handle a wide range of input AC voltage (100 – 300 Volts) which enables the purifier to stay resilient towards frequent power fluctuations, a common problem in developing countries like India. PUSH-FIT COMPONENTS FOR LEAK-PROOF & MAINTENANCE-FREE PERFORMANCE All the fittings and components in the purifier are push (snap) fit to prevent leakages and wastage of water. Additional protection against leakages is built-in by using rubber O-Rings inside the push-fit fittings. FOOD GRADE, NON-BREAKABLE, ABS PLASTIC CONSTRUCTION Non-breakable feature of ABS plastic ensures higher durability & longer life of the purifier. Food grade classification ensures that no harmful chemicals leech into purified water.